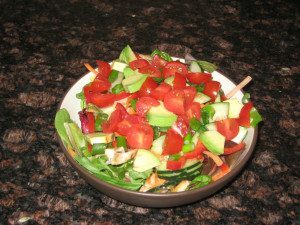 Simple salads – every day! It’s been a while since my last post. Life got a little hectic, but like any plan – whether it’s a resolution to eat well, get to the gym, or yes, blog – when you get derailed the only thing you can do is get back at it and try harder next time. So here I am! Miss me? Last post I promised to write about salads, and how my family almost always starts each dinner with fresh, colorful veggies. 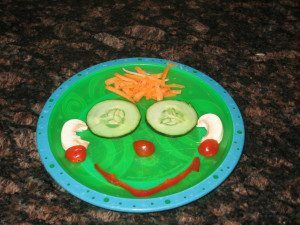 I love having a salad before our main course, as it’s a great way to make sure we get our daily servings of vegetables – and it’s filling. Without the salad course first, I might find myself taking seconds or more at dinner. I also find that when I go a few days without eating a salad, like when I travel or go on vacation, I actually crave one after a while. Buy only the vegetables you like and which will keep for one week (or however often you go grocery shopping). 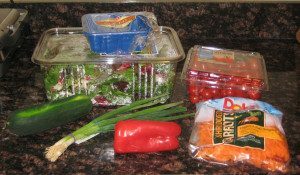 Cut vegetables spoil easily, so plan ahead and don’t overdo it. Don’t be afraid to cut corners and buy prepared, fresh produce. 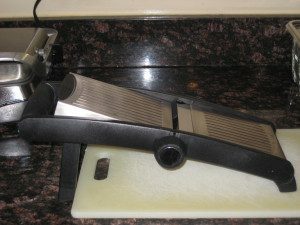 Even though it’s more economical to buy heads of romaine or other lettuce, I hate rinsing, scrubbing out dirt, patting dry and chopping lettuce leaves. I prefer the baby greens which are easier to rinse and serve. 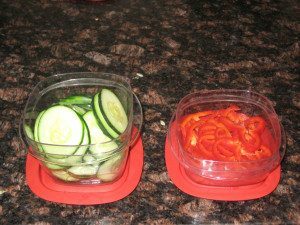 Most salad toppings do need to be cut, but do it once or twice a week, and keep cut vegetables in sealed containers. Great article, people need to eat more salads. I found an easy way to make em, take a big bowl of water, just cut up vegs, throw in and slosh the pile around to wash. I’m too lazy to wash the other way.